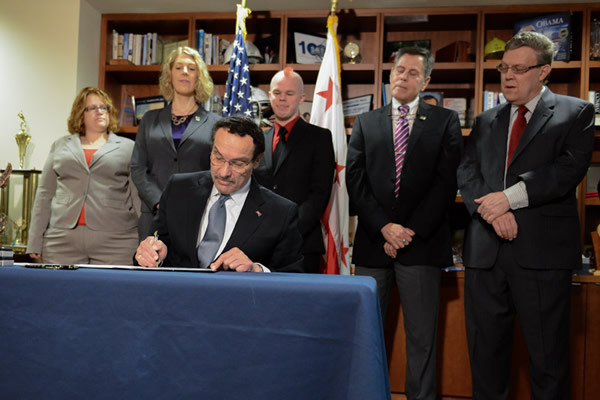 D.C. Mayor Vincent Gray on Monday signed a bill passed unanimously by the City Council that bans mental health professionals licensed by the city from performing so-called conversion therapy on minors. The Conversion Therapy for Minors Prohibition Act of 2014 imposes fines and other penalties for licensed therapists and other licensed mental health professionals seeking to change the sexual orientation of people under the age of 18 from gay to straight. “I am proud to sign a bill that protects youth and their families from the discredited practice of conversion therapy,” Gray said at a bill signing ceremony outside his office, which was attended by LGBT rights advocates. The Washington Blade notes that bills like these must be reviewed and approved by Congress before becoming law. Truth Wins Out encourages the Republican majority in Congress to uphold this law, rather than wasting their constituents’ time and money trying to fight to preserve legalized child abuse.